Lily Engbith graduated from Yale College in 2017 with an Intensive BA in political science. Her undergraduate research focused mainly on the relationship between the American presidency, democratic theory, and US party formation. Outside the classroom, Lily served as an editorial intern for the Yale Alumni Magazine, a peer liaison for both the Asian American Cultural Center and Yale Visiting International Students Program, and directed numerous Model UN conferences at the collegiate and high school levels. Lily is particularly excited to explore new dimensions of comparative politics first-hand in Hong Kong and looks forward to engaging with students and hearing their perspectives both within and outside the classroom. Aside from her academic interests, Lily is excited to learn more about the teaching of humanities in an international context, experiment in the kitchen with Cantonese cuisine, and begin training for the 2019 Hong Kong Half-Marathon. 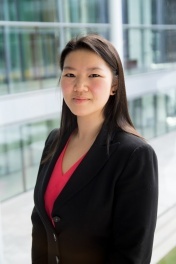 Prior to her appointment as a Yale-China Fellow, Lily served as a Research Associate with the Yale Program on Financial Stability at the School of Management, a new center jointly led by Professor Andrew Metrick and former Treasury Secretary Timothy Geithner.